Well, I had a funny feeling it would bite me in the b*tt starting a new lab with a 6 year old O/S (Server 2008 R2 is really Server 2010.) So, time to dust out the Windows Server 2012 R2 Evaluation ISO (Server 2014 really.) If you’re wondering what bit - there’s some nice PowerShell DNS cmdlets I wanted to use, and these only work with Server 2012+ (to be revealed in a future post.) Of course, it would have worked fine using 2008 R2 DCs and just have a Windows 2012 R2 server for running the DNS cmdlets (future WFA server), this post is written whilst away from home though, and had no existing DC on my laptop. Using an ISO downloaded ages ago, stick it in the DVD drive, boot the system, and follow the prompts to install. It’s super easy so I’m not going to detail it here. Note: This is taken from an old 10 February 2013 post. Change variables used as per requirements. The following commands rename the computer, configure IP address, install ADDS, create a new DC in a new forest, and configure DNS reverse lookup zones. 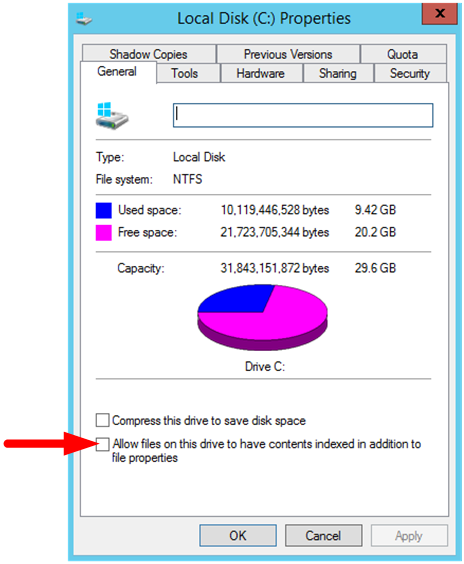 2) Disable indexing on disk (minor performance gain where there’s no need to search for files on disk). Not researched the PowerShell commands to do it (not in a good internet area whilst I write this) - will be adding a Certification Authority later on.